I baked myself a cake that was simple but complex in flavors for me to appreciate what I’ve made without slaving away in the kitchen. 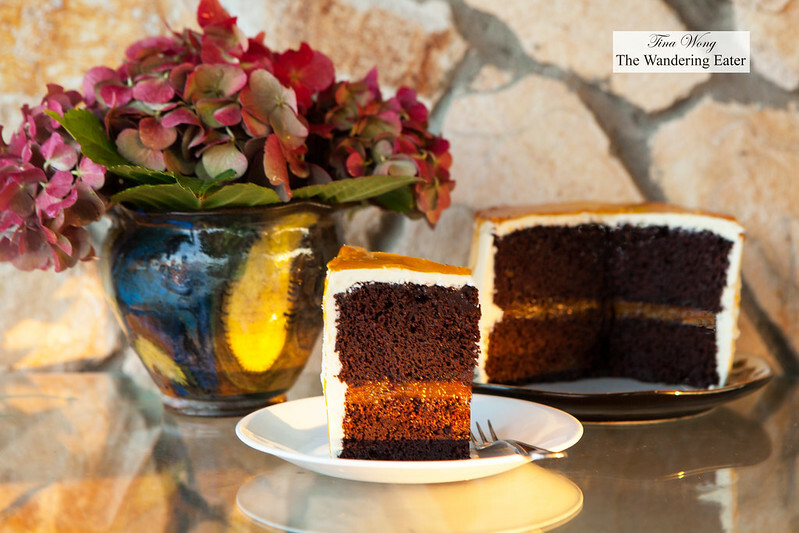 I always love tropical flavors with chocolate and it certainly did not feel like autumn yet, so I created a chocolate cake with layered with flavors of mango and lemongrass. Together, it’s a wonderful cake. Moist, deep chocolate cake meets the right amount of sweet-spicy ginger and mango jam and the lemongrass white chocolate frosting added enough gentle sweetness and a little twang of lemongrass flavor to make your palate think about that haunting flavor. *The jam is store bought. 1. In a small saucepan, heat up the heavy cream and lemongrass until the cream starts to simmer. Turn the flame on low and let it simmer for 5 minutes. Turn off the flame and cover the pan and let it set aside for 1 hour to let the cream infuse with the lemongrass. 2. After the hour is up, strain the lemongrass from the heavy cream into a small bowl. Grab a wooden spoon or a spatula and press squeeze the lemongrass of any cream. You want to make sure you have every precious drop of that wonderful lemongrass flavor. Set aside. 3. Melt white chocolate in a bowl set over a saucepan of water that is not quite simmering. Make sure the bottom of the bowl rests several inches above the surface of the water. Stir chocolate until smooth and let cool to room temperature on the countertop. 4. Sift the powdered sugar into a medium-sized bowl. Using a whisk, stir in the infused heavy cream until all of the sugar has dissolved and mixture is smooth. Add butter, vanilla extract, and salt and continue to beat until smooth and shiny. With a rubber spatula, stir in the cooled white chocolate. 1. Position a rack in the center of the oven and preheat the oven to 350 degrees F. Lightly butter the bottom of two 9-inch round cake pans. Line the bottom with parchment paper, then butter and flour the parchment and the sides of the pans. 2. In the bowl of a stand mixer fitted with the paddle attachment, combine the sugar, flour, cocoa, salt, baking powder, and baking soda, mixing on low speed. Mix in the eggs, oil, and milk. Increase the speed to medium and beat for 2 minutes. Reduce the speed to low and mix in the water. The batter will be soupy. 3. Divide the batter evenly between the cake pans. Bake for 30 to 35 minutes, or until a skewer inserted in the center comes out clean. 4. Remove from the oven and cool on a cooling rack for 5 minutes, then turn the layers out onto the rack and cool completely. 1. Place one cake layer on a serving plate. 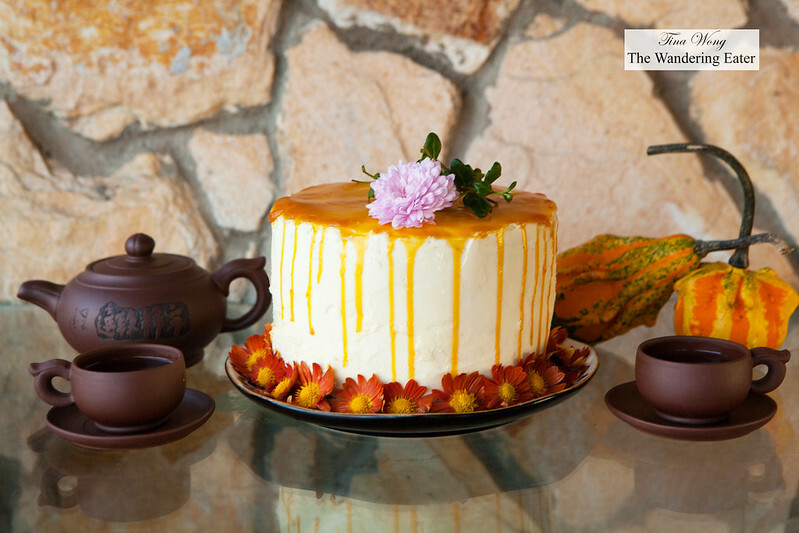 Spread about 1 cup of mango ginger lime jam on the top of the first layer but leave about 1/2 inch from the edge of the cake so when you top your cake with the other layer, the jam will not ooze over the edge. 3. Slice, serve and enjoy!